The method of up-converting is easy, and I prefer to use Adobe Premiere Pro when working in video production. 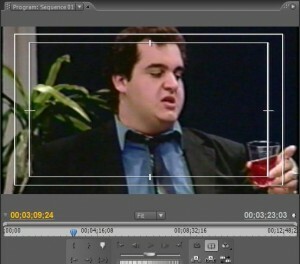 I myself have been shooting video as far back as 1993 on VHS (yes, I proudly state that and thus date myself). TV stations and cable channels are still using their old analog/DV formats when they need to pull file footage or vintage programming. For my Thesis in late 2009 for my Masters Degree in Education from Nova Southeastern University, I produced several reels comprised of both HDV and DV footage, including a considerable amount of archived material on VHS and 8mm tape. When you’re working with DV in an HD project, be prepared because there WILL be resizing involved. 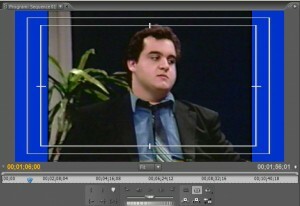 Here’s what can be done, by using a frame of VHS footage from my college TV Production archive, dubbed to DV and then captured by Adobe Premiere Pro. 1.) The simple Two-Step Fit-to-Frame With No Background. Fit-to-Frame With No Background from Patrick Sammon, Jr. on Vimeo.2.) Fit-to-Frame With Image or Animation Background. Fit-to-Frame With Image or Animation Background from Patrick Sammon, Jr. on Vimeo.3.) The Simple SD-to-HD Upconvert using Plugin/Software. Another option, you can use a marvelous little, and extremely affordable, up-convert plugin from Red Giant called Magic Bullet Instant HD. Instant HD effectively takes your SD video and fits it within your HD parameters, i.e. takes your 720 x 480 AVI and resizes it to an HDV size of your choice. I’ve had this plugin since May 2010, and it’s come to my rescue many xtimes. Easy install, easy use. Drag, drop, set, and render. 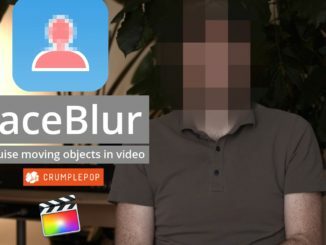 The plugin works with AVI as well as MPEG, so you have a choice to either use your raw AVI, or go ahead and transcode to the highest quality MPEG you can produce. I chose to transcode to HQ MPEG. Go ahead, I dare you! SD-to-HD Upconvert Using Plugin/Software from Patrick Sammon, Jr. on Vimeo.We media techs have choices when it comes to using DV/AVI footage in HD environments. It all depends on how we want to proceed, and the role in which your archive footage plays in your final cut (no pun intended). Author’s Notes: These stills are from a March 2002 three-camera live-to-tape shoot project of the diner scene from the Denzel Washington film Training Day (2002). This was my TV Production final class project: a scene that could go on longer than 10 minutes without a cut. 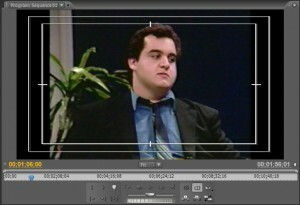 Dubbed from VHS to DV, captured to Adobe Premiere Pro via DV and Firewire 400.